A new Marine greets his family following his graduation ceremony August 14, 2015, on Parris Island, S.C.
—USMC photo by Jennifer Schubert. All military installations, including the Depot, have rules that must be followed for security and to maintain an organized community and lifestyle while on the base. It's all part of the new military lifestyle your son or daughter is learning. 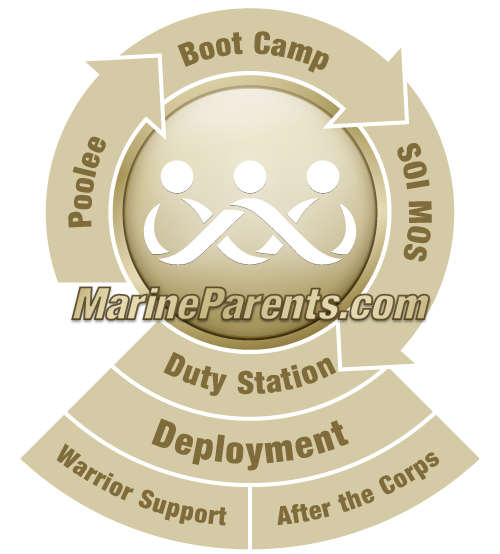 While at the Depot (MCRD Parris Island) you are a guest on a military installation as well as a guest of your future Marine. Your actions on the depot are a direct reflection on your son or daughter. Please be courteous and respectful. All recruits are issued one graduation packet with the battalion commander's graduation invitation letter sometime around week 9 of their 12-week training cycle. The recruits decide who will receive their graduation packet. Vehicle/parking passes are no longer included in the graduation packet as they are not required for typical daily visitors of Parris Island, such as those coming for graduation and other related events. Vehicle operators failing to present these items will be denied entry to the Depot. All vehicles coming aboard the Depot are subject to search by military police. The operation of a motor vehicle aboard the Depot is a privilege granted by the commanding general under the condition that the driver adheres to all regulations. Drivers of vehicles must consent to the search of their vehicles by authorized personnel at any time while aboard MCRD Parris Island. Driving Regulations are enforced by the military police who are under the direction of the Provost Marshall's Office. All driving rules and regulations are strictly enforced! All vehicles must stop at the front gate. Turn signals must be used 100 feet before turning. All children 5 years of age or younger must be secured in a child safety seat. Cell phone use while driving is prohibited unless phone is a hands-free device. Do not park on grass or in any reserved parking space, including curbs painted yellow. Do not move or circumvent barricades. Keep out of all restricted areas (on base housing and permanent personnel quarters). All persons entering the MCRD are subject to search and seizure of illegal substances. Weapons of any type, alcohol, glass bottles and illegal drugs or paraphernalia are strictly prohibited on base. All bags, packs, camera bags and personal property will be searched. Guests are encouraged to limit baggage brought into the MCRD. This will facilitate expeditious entry. Entry into the MCRD constitutes consent to search of personnel and the property under their control, pursuant to internal security act of 1950, section 21, 50 u.s.c. 797 (1979). The MCRD is an active military base. Due to national security concerns, any jokes or references will be treated seriously and will result in eviction from the base and possible arrest.